TeamViewer has been a great remote access program since the beginning of time (maybe not). It is free for personal use (yes, all the possible features), such as remote support for your friends and family, or to access your own computer at home or at work. If you are a business, it is still relatively cheap compared to other software and services. 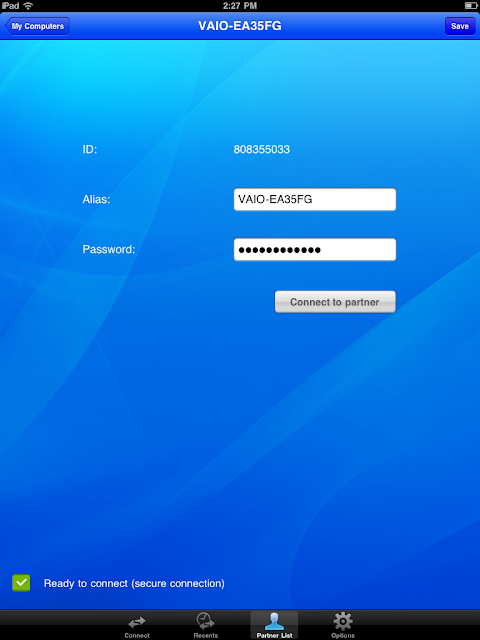 TeamViewer also has mobile versions for iPhone, Android and for iPad. This article is a walkthrough on how to set up and use your iPad to control your computer very easily. Okay, let us think up a hypothetical situation where you might find this useful. Say you have a laptop that you carry with you to and from work everyday. Instead of doing that, you can leave your notebook at work, running and connected to the Internet and bring your iPad home. From experience, I can say that using TeamViewer to work with office apps (I tried MS Office 2010) and pretty much anything else is surprisingly convenient and hassle-free. Also, TeamViewer is pretty easy to set up, it's free and theoretically, it should work through the toughest VPNs, firewalls and proxies. And it is secure. I am writing this as a guide for the iPad, but you can use TeamViewer Mobile on your iPhone, iPod touch, Android phone or tablet to control a PC, Mac or Linux machine. You cannot control a mobile device from any of these computers, but you can remote access Linux, Mac and PC from each other. I am assuming that you have already downloaded TeamViewer HD onto your iPad by now. If not, go do it before you move on. It's a small, 11.7 MB download. I'll wait... Done? Okay, move on. Then, go here and download the relevant edition to your computer. Make sure that you download the 'All-In-One' version. The 'QuickSupport' app (for Windows and Mac) is for people who do not want to install the app natively and just want to download it to receive help from someone like you. There are also other versions (on Windows and Mac), which I need not go into detail about right now. Now also, go ahead and sign up for a TeamViewer account. You will need it to save your computer as your computer and instantly access it. Technically, you don't need this for remote access, but you do in this case. Now, install the TeamViewer application onto your computer. You will need admin access for this, since it will install for all users. The process is pretty straightforward. Remember that you will be asked if you want to later access this computer remotely. It is set to 'No' by default. You need to change that. After you are done, a wizard should automatically guide you through setting up "unattended access" to your computer. If it doesn't, you can start it manually by starting the app, clicking 'Connection' on the menu bar and selecting 'Setup unattended access...' in there. You can set a name for your computer and a password of your own. Log into your TeamViewer account when prompted. Also, if you haven't created an account on the website as I told you to do, you can create one right from inside this program. You will need to go through the boring confirm-the-email step anyway. Now, move on to your iPad. Start the app from your Home Screen as usual. Make sure you are connected to the Internet either via Wi-Fi or 3G. Remember that on a cellular connection, you can easily rack up high data charges and/or eat into your bandwidth cap very quickly with TeamViewer. You will be prompted to log in. Again, if you haven't created an account already, you can do so even through your iPad. After you're in, you should see your computer in 'My Computers'. You should also see that it is online if you have left it running and connected to the Internet. Tap your computer. You will see the following screen. You should now enter the password you had set for your computer if it is not entered already. If the password was generated by TeamViewer, it should already be there. Then, tap 'Connect to partner'. You should be able to see your computer's screen on your iPad in a few seconds. As I have already said before, this article was written with an iPad and a Windows 7 machine. Some settings could be different on different systems and devices. By default, the quality of the remote access is dependent on your connection. If you are on a relatively slow connection, the wallpaper might be blank and some quality might be lost. But you can change all that in the settings. In the screenshot up there, my laptop screen seems to fit the iPad perfectly. This is because I set the resolution to a perfect fit. The laptop's resolution actually changed when it was being controlled by my iPad. By default, you will see the native resolution of your computer on your iPad and you will need to zoom in and out constantly when using it. But you can change it to whatever you like. Explore the settings. TeamViewer HD may give the best appearance in landscape mode on your iPad. But you can still use it perfectly in portrait too, although it might be harder. You will see a set of buttons at the bottom of the screen. You can use them to (in order) close the connection, bring up the keyboard (it will not show up when needed automatically), right-click, zoom in and out, perform specific actions (like remote reboot) and to change settings of the app itself. You can move the mouse pointer around the screen by placing your finger anywhere and dragging, like a laptop touchpad. To click where the pointer is, tap once anywhere on the screen. You cannot directly tap buttons or draw in Paint with your finger or whatever. To zoom in, simply pinch the screen like you normally do on webpages and stuff. To scroll, place your cursor in a scrolling zone and move two fingers up and down on the screen. To press special keys that are unavailable on your iPad, simply bring up the keyboard and tap the last button on the top bar that also comes up. A special keyboard will give you the function keys, arrow keys, Ctrl, Alt (Command for Mac, possibly) and more. For Windows on my laptop, there was a Windows key too. You need to press it twice to register a 'press' and a 'release' of the button. All these instructions are available in the app. And again, this article was written using Windows and an iPad. It all depends on the OS you are remotely accessing. 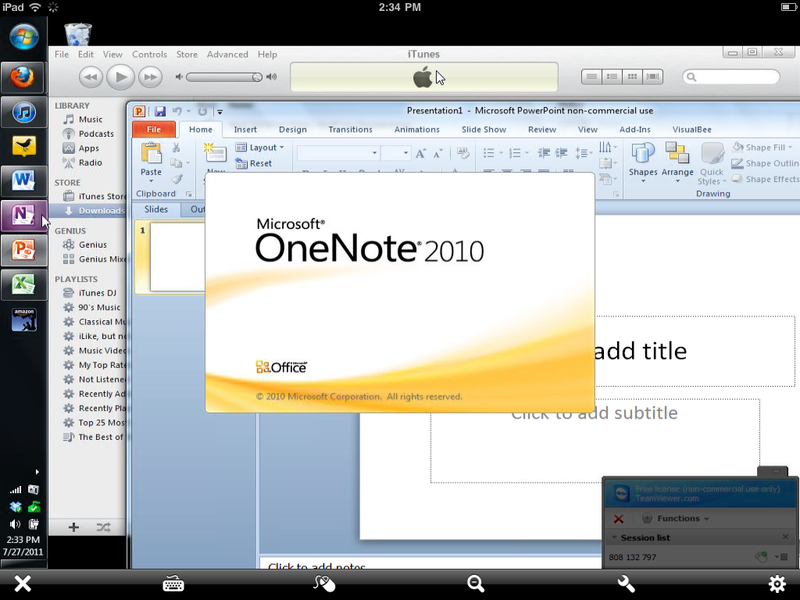 That was, in a nutshell, how to control your computer remotely from an iPad. If you explore around the exhaustive features of TeamViewer and the settings, you will also see that you can use your iPad to provide remote support to your friends and family, and even give presentations remotely. So good luck, and use it wisely!